Encouraging a broad, compassionate, humanistic approach to spirituality, this book shows how patients' spiritual needs can be communicated well within interdisciplinary teams, leading to better patient wellbeing. This book describes the art of charting patients' spiritual perspectives in an open way that will help physicians and nurses to better direct medical care. It includes practical information on how to distil spiritual needs into pragmatic language, helping to demystify spiritual experience. Drawing on his extensive practical experience, the author also suggests key points to emphasise that will enrich chart notes for medical records, including brief, relative narratives, trusting one's own impressions, reflecting holistically on the patient's life, patient attitudes towards treatment and recovery, and describing families' opinions on the health care situation of their loved one. 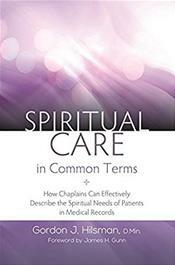 The book shows healthcare professionals of all disciplines how to engage in a shared responsibility for the spiritual care of their patients.